Okay, here's your first big choice, Union or Confederate... and the thing is, we have units pages because, well that is our raison d'être... This whole website is about reenacting, so really, while other things are important, it's the living history groups and units that we really want to showcase! 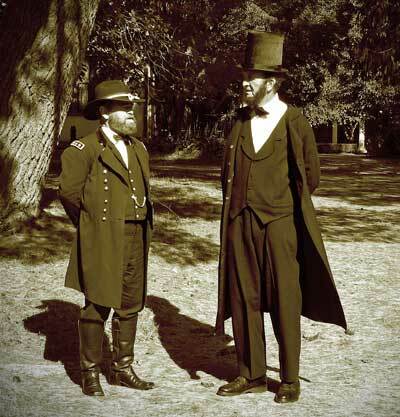 Visit the reenactor.Net's Forums! Discuss living history, the Civil War, and more! Check this out! Our Union ACW Cyber-Roster is UPDATED !!!!!!! This area is to list the union units out there. This page will expand greatly to more sections as go along and add units. The Union Army, more correctly, the Federal or U.S. Army, was the land force that fought for the United States during the American Civil War. It was also known as the Northern Army and the National Army. It consisted of the small "Regular Army" and was augmented by units supplied by the Northern states, these composed of volunteers as well as conscripts. The Union Army fought and eventually defeated the smaller Confederate States Army during the American Civil War which lasted from 1861 to 1865.
four of artillery, two of cavalry, two of dragoons, and one of mounted infantry. The regiments were scattered widely. Of the 197 companies in the army, 179 occupied 79 isolated posts in the West, and the remaining 18 manned garrisons east of the Mississippi River, mostly along the Canadian border and on the Atlantic coast. With the secession of the Southern states, and with this drastic shortage of men in the army, President Abraham Lincoln called on the states to raise a force of 75,000 men for three months to put down the "insurrection." Lincoln's call forced the border states to choose sides, and four of these states then seceded, making the Confederacy eleven states strong. The war proved to be longer and more extensive than anyone North or South had expected, and on July 22, 1861, Congress authorized a volunteer army of 500,000 men The call for volunteers initially was easily met by patriotic Northerners, abolitionists, and even immigrants who enlisted for a steady income and meals. Over 10,000 Germans in New York and Pennsylvania immediately responded to Lincoln's call, and French immigrants were also quick to volunteer. As more men were needed, however, the number of volunteers fell and both money bounties and forced conscription had to be turned to. Nevertheless, between April 1861 and April 1865, at least two and a half million men served in the Union Army, of whom the majority were volunteers.